I'm interested in these compatibles for my Lexmark C734dn printer, but I'm concerned they'll not work out of the box. We had an issue with another supplier on a different Lexmark laser a couple of years ago, who also guaranteed they would work, but they didn't. What reassurances can you give me? Our compatible Lexmark C734dn toner cartridges do work perfectl;y well in the printer and we've had very good feedback about them from our customers. The compatible C734dn toner cartridges we sell are fitted with the correct cartridge chip that is needed for your printer so they can be installed directly into the machine in order to produce high quality prints. We back this up by offering you a full, 30 day money back guarantee on our compatible Lexmark C734dn cartridges so you can send any item that is unsatisfactory back to us for a full refund. Could you please email me when the premium brand compatible black and yellow Lexmark C734dn toner cartridges are back in stock? Kind regards, Margaret Nicholas. As soon as products come back into stock our website is instantly updated. We currently now have stock for the full range of compatible Lexmark C734dn toner cartridges. Shopping for a Lexmark C734-dn toner from right here allows you to save a large amount of money and time. Our company has a low cost promise to ensure that you receive excellent deals on your Lexmark C734 dn toner cartridges so you do not have to go shopping with expensive electronics stores Furthermore, we will only ever will offer you Lexmark C734dn toner cartridges which are both inexpensive and also precision engineered and so you can get security with each order. Here at Cartridge Save you will get fast and free delivery on Lexmark toner cartridges. Pay less when you purchase value Lexmark C734dn toner when you use Cartridge Save's online store. Meanwhile, it is possible to buy a cheap Lexmark C734-dn toner cartridge by simply phoning the orders line in person when the time suits. Customer care is our top concern and we provide you with a full cash back guarantee on Lexmark C734 dn toners to provide absolute peace of mind. To get the cheapest deal on Lexmark C734dn toners you cannot get better than shopping at Cartridge Save. Lexmark has figured out the secret to balancing speed and print quality with their C7234dn colour laser printer. This printer may be one of the best options for any small business that is looking for a decently priced machine that can grow with the company. Lexmark has had a few years of rocky manufacturing and lagged behind some of the competition, but with printers like this they have revitalised their position as a leading company in this market. The design of the C734dn is both simple and straightforward. The 550 sheet input tray is located in a pull out tray along the front side as well as the 100 sheet multi-purpose tray. The finished prints come out the top of this printer in a 350 sheet output that can handle all sizes from letter to standard legal. 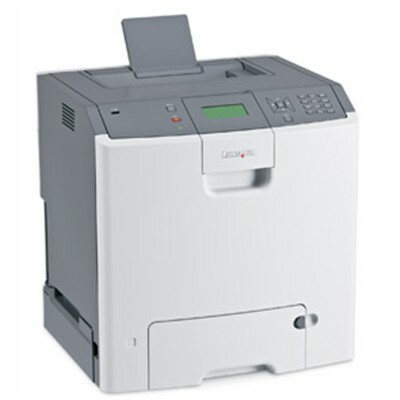 The printer is controlled by a adjustable 4-line LCD display and a series of navigation buttons and feature controls. The front panel opens up to reveal the Lexmark C734dn tray, the photoconducting drums, and the internal mechanics for the automatic duplexing. It's also very easy to access the Lexmark C734dn toner should you need to replace them. The first thing that any user will notice is the sheer printing speed of the C734dn. This printer can produce black and white standard prints at a staggering 28 pages per minute. Along with the low cost C734dn toner cartridges, this is one of the most efficient printers on the market. The USB port near the LCD display also makes for a great little tool in most office settings. There are also options for increasing the the input and output trays later as the company grows. The automatic duplexing is a necessity for many small offices and this is one of the few printers in this price range that have one. The first problem may come into being for the clumsy operator. The sensitive photoconducting drums are located directly below the toner cartridges, which means that a an unlucky slip could result in damaging the internals. The other fault of this printer comes down to very bright colour schemes. The printer tends to be a bit heavy on the toner ink on colour-rich palettes making for an oversaturated effect. The only other qualm would be the lack of a wireless connectivity, which would make it the perfect it the premier printer at this price range and size.